World Read Aloud Day 2015 is on the 4th of March. 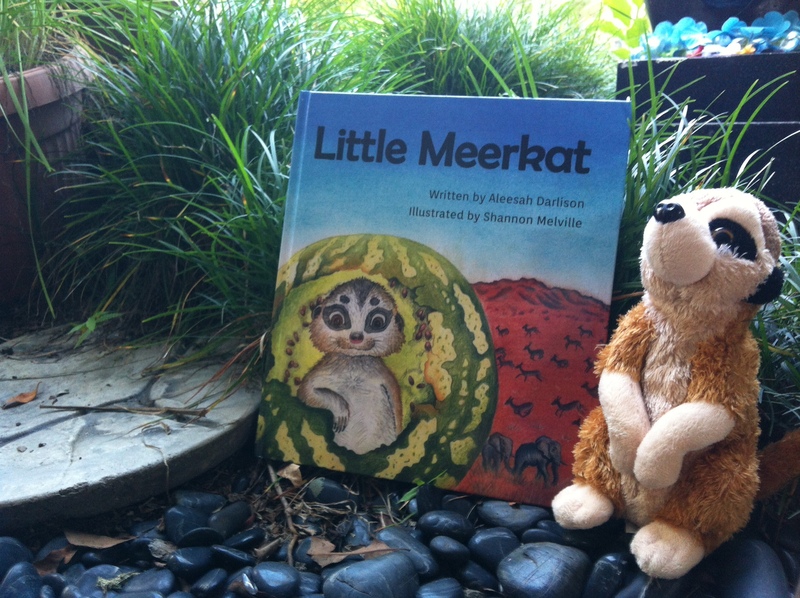 To celebrate, I’m featuring a very cute picture book: Little Meerkat written by Australian author, Aleesah Darlison, and published by Wombat Books. 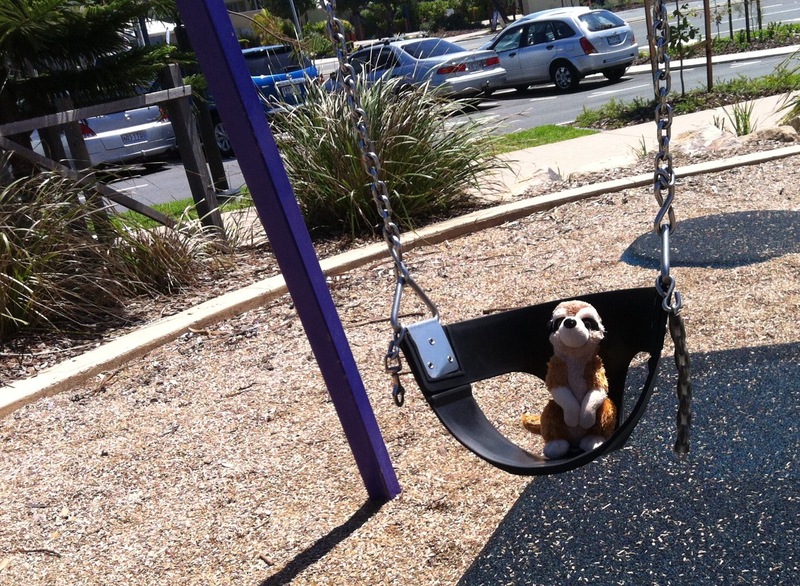 Little Meerkat is the delightful story of a brash baby meerkat who craves independence and adventure. He doesn’t like to be treated like a baby! But through his misadventures, he learns how important–and comforting–it is to have his big, loving family and community nearby. Aleesah kindly gave Little Meerkat permission to visit with me for a few days. For the purposes of #WRAD15, I am stepping into the role of his free-wheeling, big-spending fairy godmother. 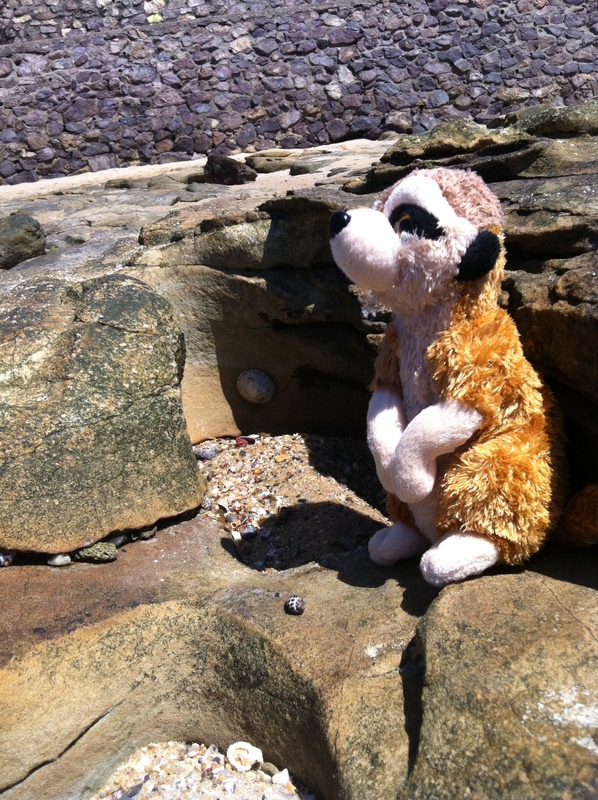 Little Meerkat’s every wish is my command. 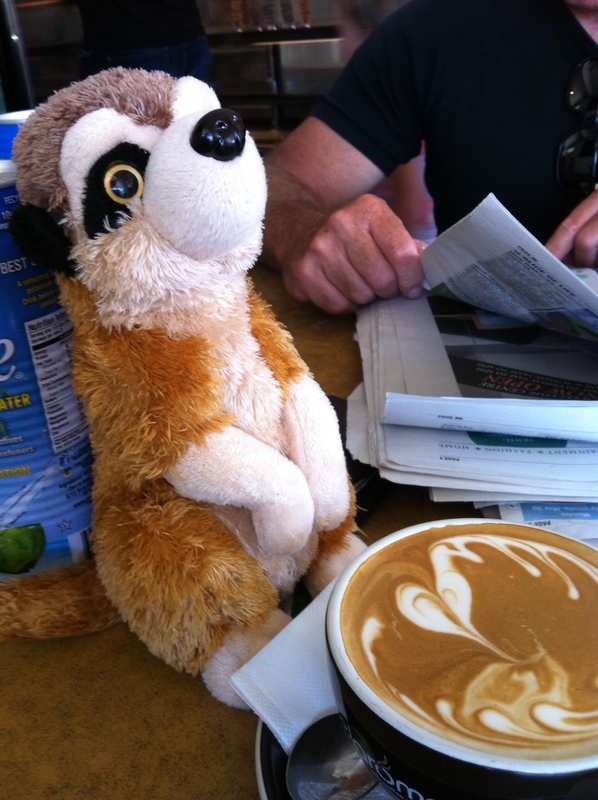 We got together today over a flat white and mapped out some of his wildest dreams. I have to say: for a little fellow, he sure dreams big! I suggested a romp at the park. Little Meerkat thought that was cool. 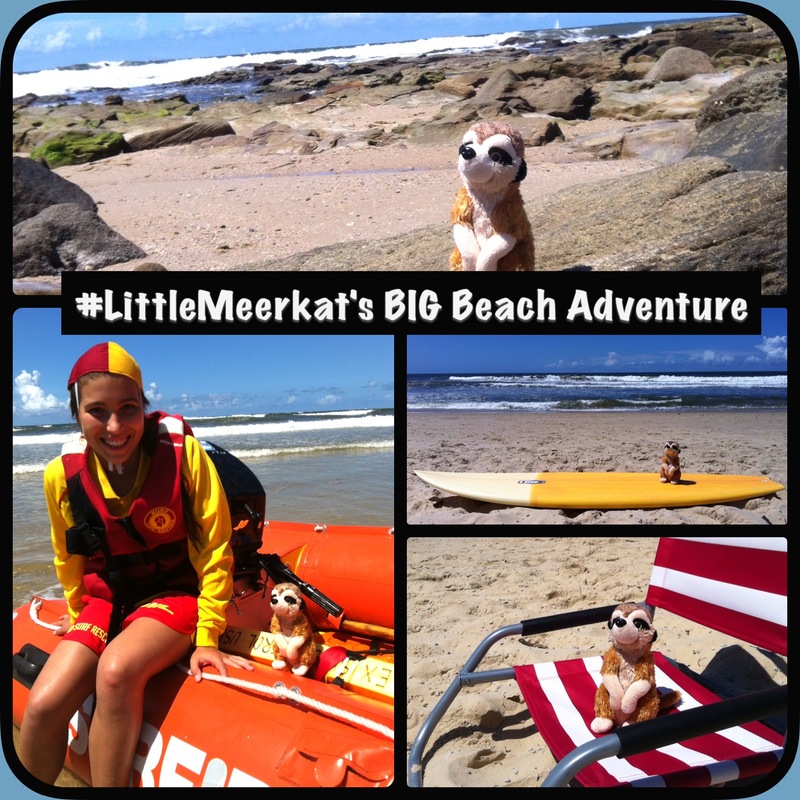 Little Meerkat is a grommet for a day! 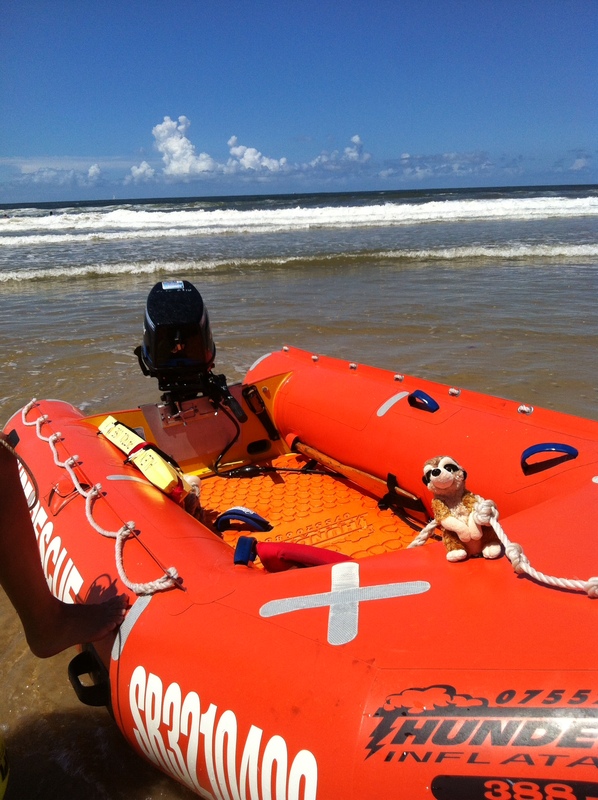 …To ride in one of those rescue boats! 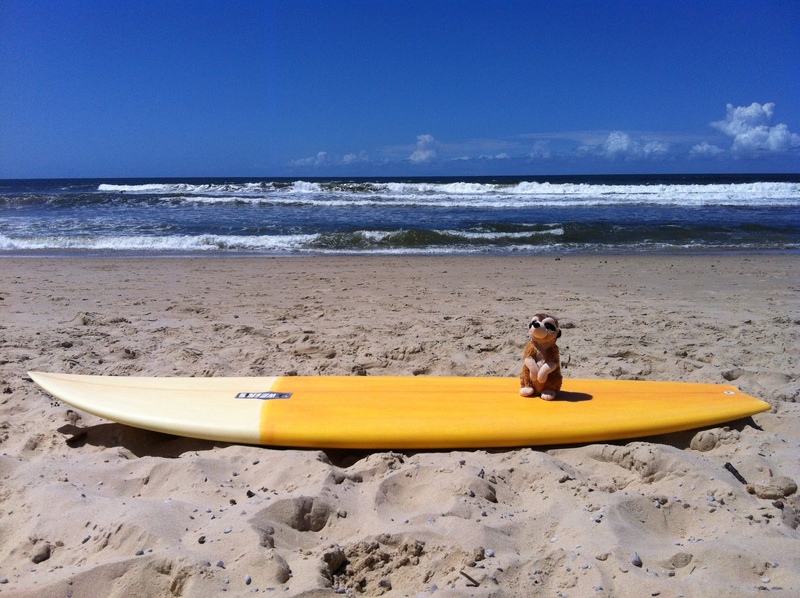 So I introduced him to a trainee surf lifesaver. Lifesavers have to keep a keen lookout for danger–just like meerkats, who keep a watchful eye on the grasses of the savannah! 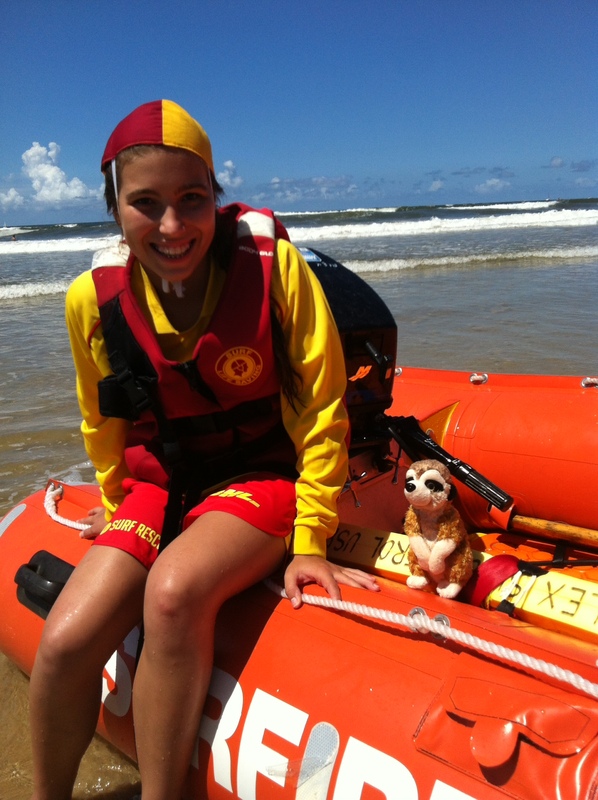 Little Meerkat admired the lifesavers’ hard work and commitment to the community. 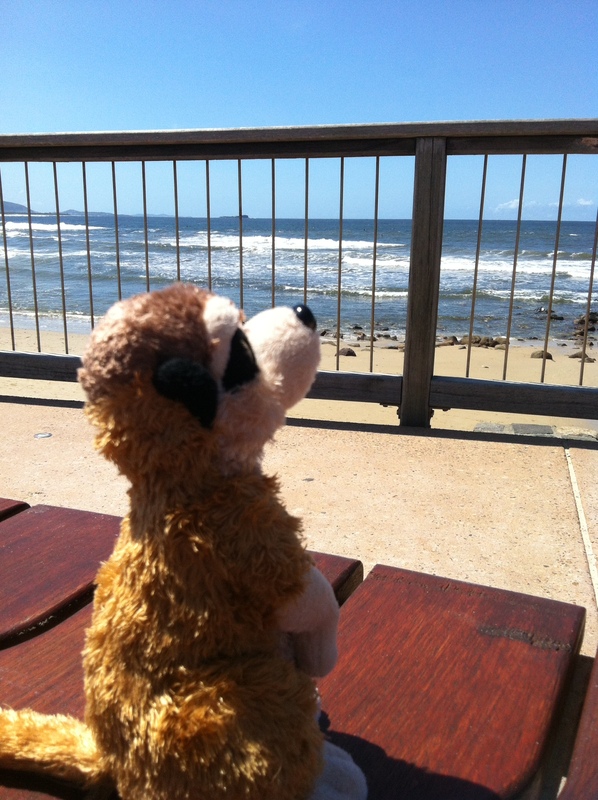 It reminded him of home, where big meerkats keep grommets like him safe from danger. …To look for some seashell souvenirs for Aleesah. Tomorrow, we’ll pop them in an envelope and post them to her as a surprise! This is Fairy Godmother Ali, over-and-out. 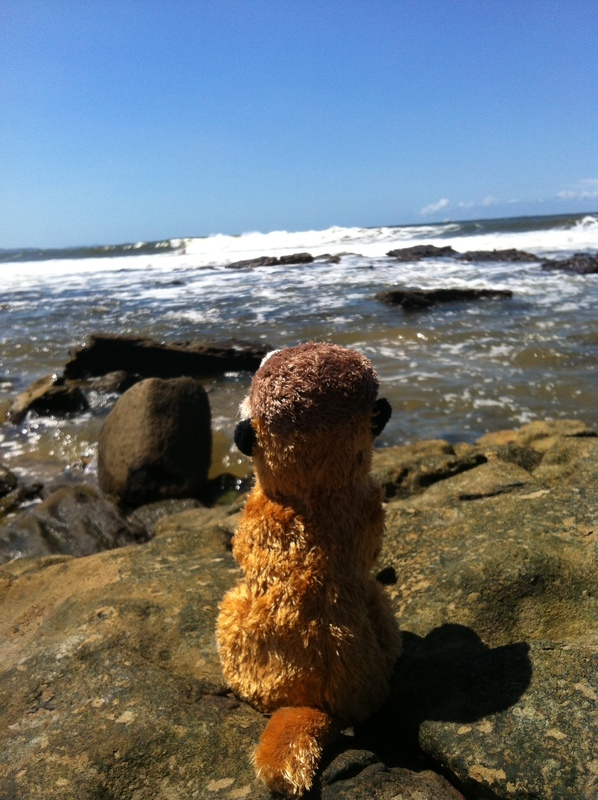 I’m off to plan more BIG Adventures for Little Meerkat. 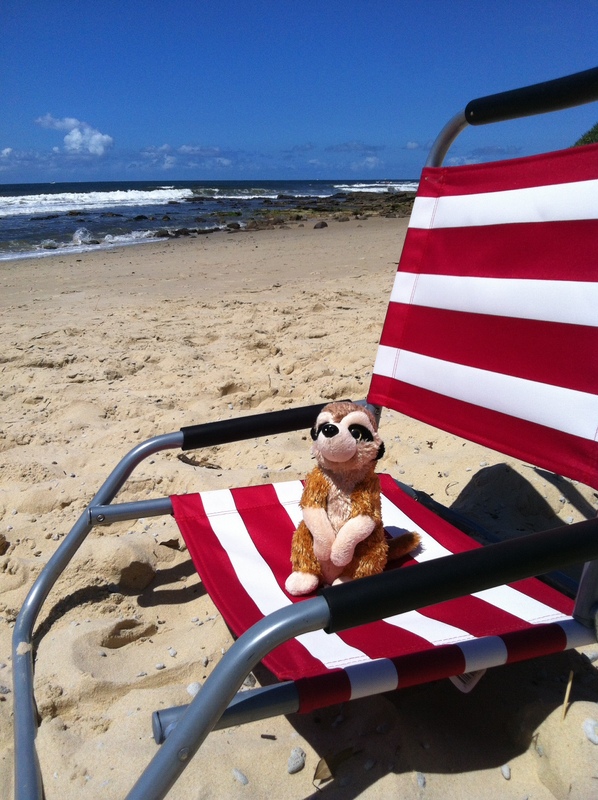 You can buy a copy of Little Meerkat at the Wombat Books website. We had so much fun, Annette! I LOVE the photos! What a fun trip! 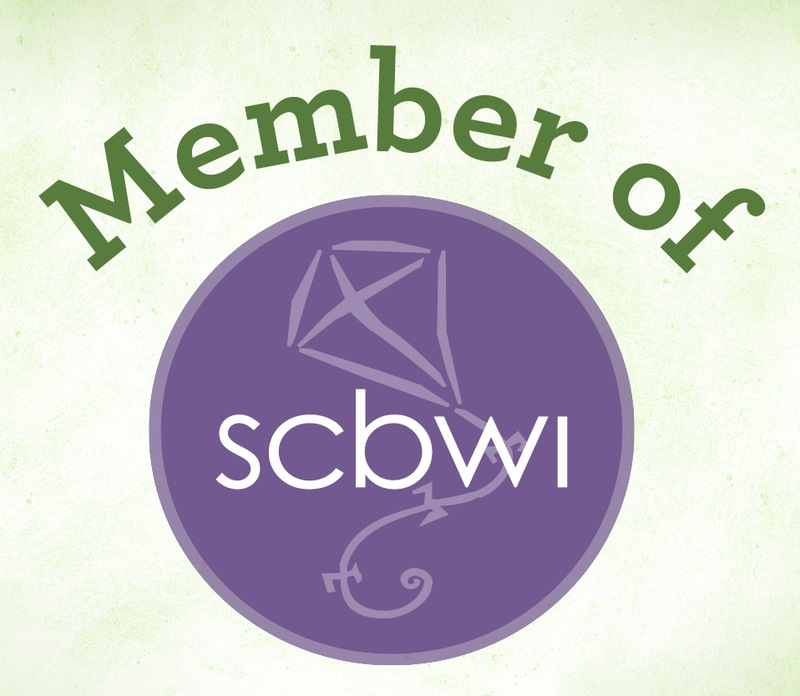 Thanks for visiting and commenting! We had fun!